***MINI Cooper Convertible*** Automatic, Heated Seats, Bluetooth, Very CLEAN, LOW Miles!! 2017 MINI Cooper Convertible... White Silver Metallic on Black Interior... Automatic Transmission... Like NEW Condition... ONLY 16,147 Miles!! CAR FAX Certified 1-OWNER Vehicle with MINI Bumper to Bumper Warranty Coverage Included!! WELL Equipped with a power-operated fabric convertible roof (with sunroof-like function), heated front seats, keyless ignition and entry, 16-inch alloy wheels, an electronic limited-slip differential, automatic headlights, automatic wipers, heated mirrors, remote locking/unlocking, keyless ignition, a tilt-and-telescoping leather-wrapped steering wheel, adjustable driving modes, dynamic ambient lighting, automatic climate control, a cooled glovebox, cruise control, height-adjustable front seats, a center armrest, 50/50-split folding rear seatbacks. Technology highlights include Bluetooth connectivity, smartphone app integration, a 6.5-inch display screen and a six-speaker sound system with HD radio, a USB port and an auxiliary input jack. Please feel free to contact our experienced sales team with ANY questions or to schedule a test drive. Buy with confidence from the area LEADER in Pre-Owned LUXURY. Additional 5 Year/100K Extended Warranty Coverage Available. ALL of our vehicles are meticulously detailed and serviced by our factory trained certified technicians. Call or email us at sales@rjfoley.com **$0 Down** 100% financing available with great rates! Trades are always welcome. National and International shipping quotes are available. 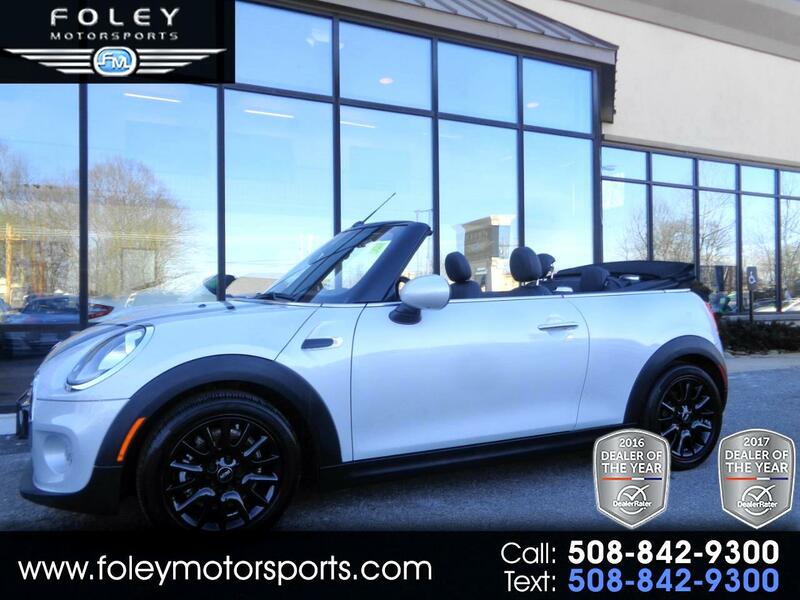 Message: Thought you might be interested in this 2017 MINI Convertible.